First Line: I felt ridiculous. Genealogists Sophreena McClure and Esme Sabatier are giving the gift of family history to the mother of a friend. Olivia Clement is hoping to learn more about her father, a man who disappeared before she was born. Before Sophreena and Esme have much of a chance to begin looking, Olivia's son-in-law is murdered, and police think that the killer is a young filmmaker who's creating a documentary of their small town. The two intrepid genealogists are convinced that someone else wanted Olivia's son-in-law dead, and that the truth can be found buried deep in cartons of memorabilia and 1940s film canisters. Sophreena is going to have to put her researching skills into high gear. 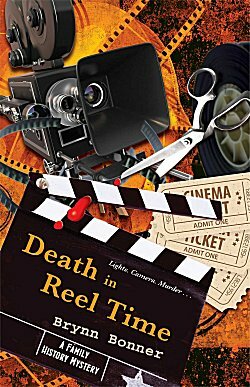 I enjoyed Death in Reel Time even more than I did the first book, Paging the Dead. There's a real chemistry between Sophreena and Esme, and the humor in their conversations with each other often made me laugh out loud. Esme's psychic gift of being able to hear the dead speak to her is not used to excess, and the books are so strong that I feel Esme could lose that ability altogether and it really wouldn't be missed. Sophreena and Esme aren't the only game in town, however, because they are surrounded by a strong group of friends that I would like to see take a larger role in future books. One of the main reasons why I enjoy this series so much is because family history actually plays an integral role. Those great-great-ever-so-greats prove time and again that history does repeat itself. That the murder of today could be rooted in the insult of decades past. Sophreena's researching skills are first-rate and fascinating. It's rare to find a cozy series that has a "hook" that's every bit as strong as its characters, and Bonner's Family History series is one of them. In the first book, I learned about heritage scrapbooks. In Death in Reel Time I learned about video scrapbooks. I know I'll be enjoying the characters and the mystery in book number three, but I'm also dying to find out what I'll be learning about in the genealogy field. Bring it on! I find genealogy really interesting, Cathy. And I know a lot of people get very, very much into it. So I can see how it would work well in a series. Sort of reminds me just a bit of Steve Robinson's Jefferson Tayte series. Yes-- another good series that focuses on mystery and family history!